Pre-measured volume helps avoid overfeeding. 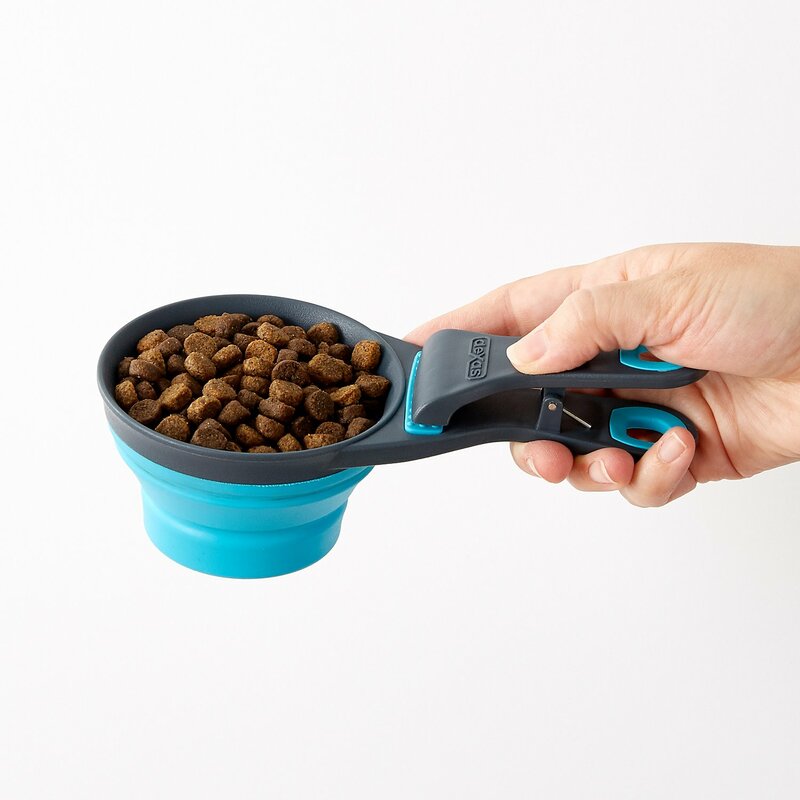 The KlipScoop is perfect for portion control when feeding your pet! The attached clip also allows you to seal your pet food or treat bag. Controls portions, pre-measured volume helps avoid over feeding. Attached clip allows you to seal your pet food or treat bag. Collapses flat for storage savings and while using as clip. Made from a durable poly-canvas, with water resistant coating. I didn't realize this was a clip also until I got it... This is such a neat tool to use. It measures out perfectly, it fits in the bag to scoop perfectly, and it never gets lost because you can use it to help keep the dog food bag closed by rolling it and using the clip part to hold it closed. I love it!!! I have used a half scoop for years. just started using this 1 cup version. The clip constantly breaks on me. but I like that it's collapsible. and the cup part doesn't rip or tear and other than the spring twisting at times, it is a good scoop. I have a regular scoop but this is so much better. It’s collapsible and clips to the food bag for easy storage plus the clip is keeping the food sealed and fresh. I love it!!! I love the idea of this food scooper that also clips the bag shut. But I've bought two if these, and the spring on the clip part has broken on both of them. This 2cup measuring scoop is a perfect fit in our puppy’s food container also purchased on chewy.com. It allows you to know how much we are feeding our new puppy. Clip the bag shut, measure the food, collapse the cup for storage convenience. I loved it. It lasted about 16 months then the clip broke. I now use a more functional clip but still use the collapsible cup to measure food. If it was still 'clipping' this would be an easy 5 star. This little scoop is super stylish, compact, and does exactly what we needed it for (scooping food for our cats). Would for sure buy again! I've had this scoop for a few weeks now and like it so far. It seems well made and sturdy. The clip part is pretty good but not as strong as a large binder clip. If you have a large bag of dog food and roll the opening to close it I don't think it would work. It looks better than a clip though! I needed a scoop to help with feeding my dogs the appropriate amount of food, especially because one of them is on a diet per the vet's recommendations. 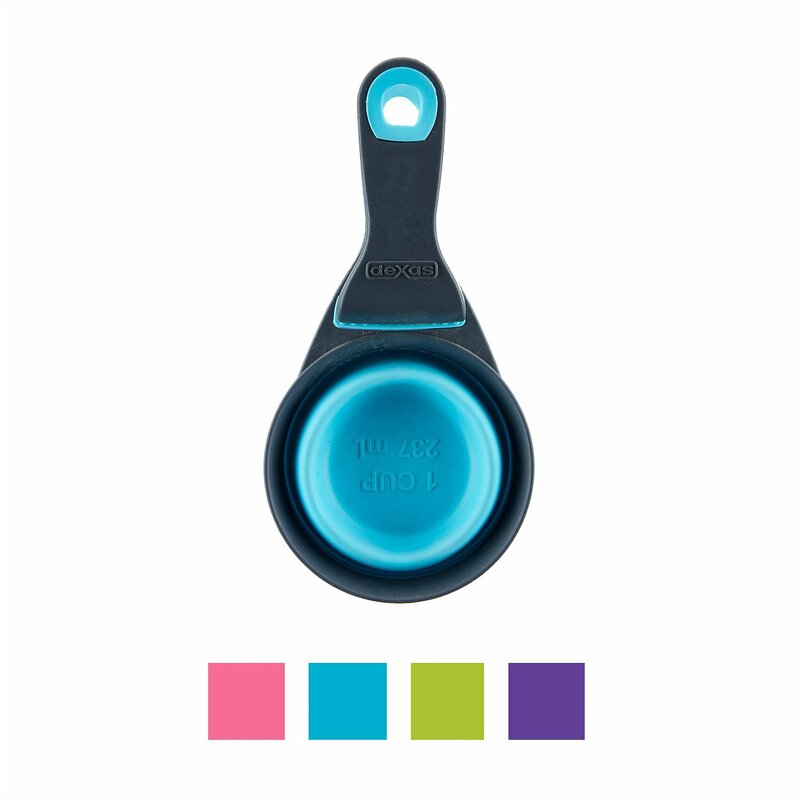 The scoop is durable and I love the color. The clip on the handle is really handy, so I don’t lose the measuring cup and keeps the bag closed for next feeding!